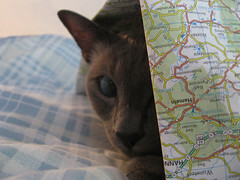 Julia decided to help us with travel plans by hiding underneath our Germany road map; I was lucky enough to have the camera close at hand. What a sweetie! Music: Rush - "Double Agent"